Tyson Henrie is a tall, soft-spoken guy who enjoys the best Utah’s outdoors has to offer. During the winter months, he’s on skis coaching at Utah’s Sundance Resort. 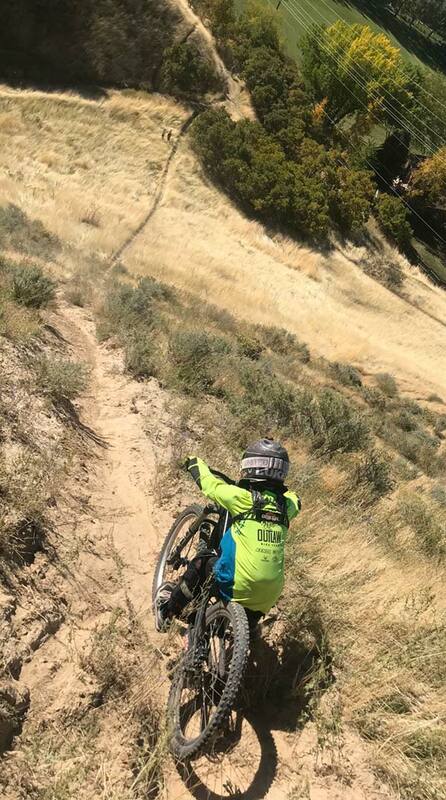 But as soon as the trails dry out, he’s riding mountain bikes with a group of young girls and boys as the head coach of the Outlaw Bike Team. The Outlaw Bike Team is a kids’ mountain biking team for young riders aged 7 to 18. The name of the game for these groms is gravity-based riding which focuses on the following disciplines of mountain biking: all-mountain, enduro, downhill, dirt jumping and freeride. Based along the southern end Wasatch Front in the Utah Valley area, the group consists of three separate age/skill levels – MegaShredders, MegaSenders, and the competition team. 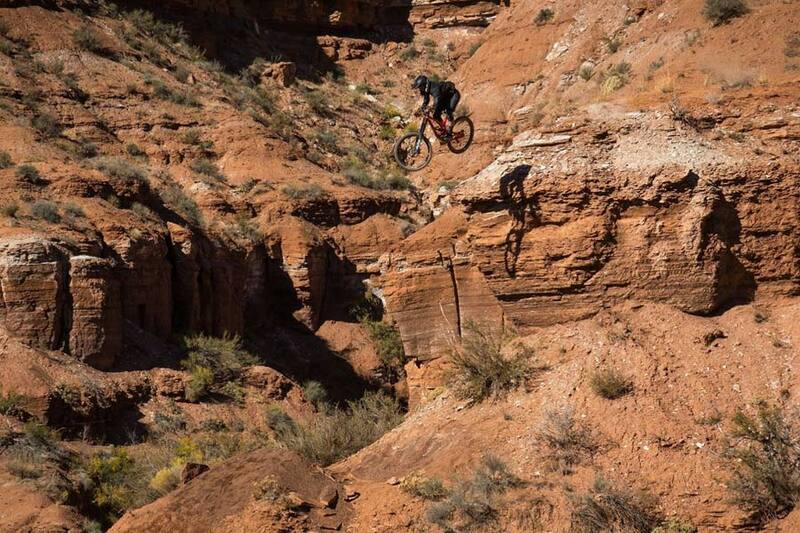 Luke Mallen, Alex Mallen, and Finley Kirschenmann scope a landing at the old Red Bull Rampage site near Virgin, Utah. Photo by JB Liautard. By teaching riders the proper techniques for body positioning, braking, and cornering, members of the Outlaw team build a foundation of skills upon which advanced techniques can be applied. Riders on the team who can execute the basics with proficiency are encouraged to increase their skill sets and move on to racing where the trails become technical due to features such as the grade of slope, table and gap jumps, ladders and bridges, rock gardens, and switchback turns. 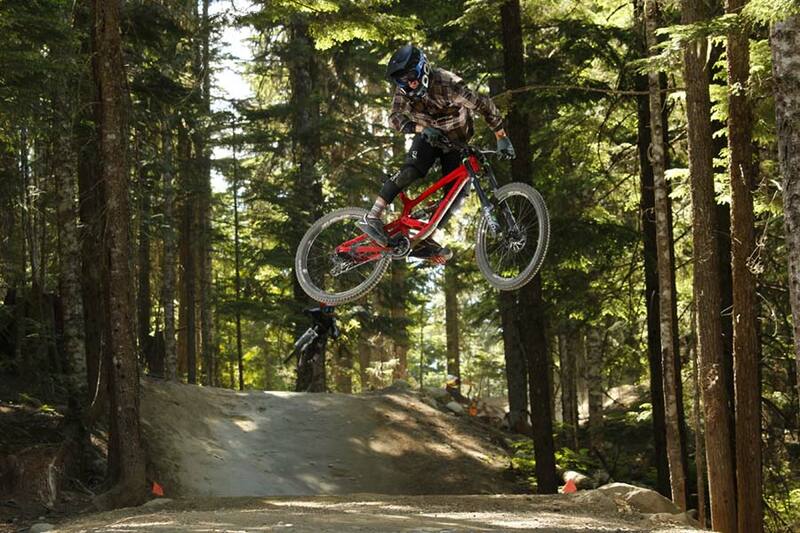 Outlaw's Dillon Flinders tilts the Whistler Bike Park sideways as he streaks down A Line. 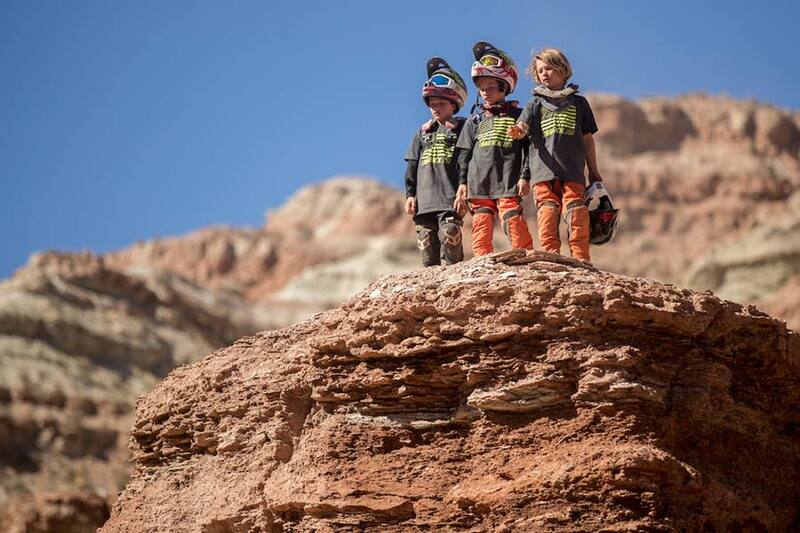 Southern Utah is a frequent destination for this pack of young mountain bikers. Photo by Steven Lloyd. 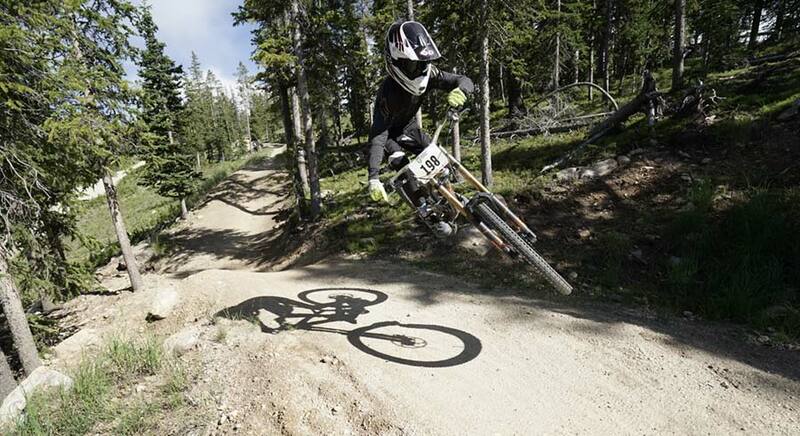 Outlaw team rider Finley Kirchenmann launches across a gap near Provo, Utah. Photo by Tyson Henrie. The next level up, MegaSenders, is the intermediate group. This team has built upon the mountain biking fundamentals needed in order to move up a level and begin competing. Members of this team (which is also for kids age seven on up) need to adhere to the same regulations and licensing requirements as the MegaShredders. Fall training at this level is available for riders who want to continue to enhance their skills. Finally, there’s the competition team. This is the team’s highest level. It’s for kids aged nine and up, all of whom must have graduated from MegaShredders and show that they have advanced mountain biking skills. Members of this team need to have a full suspension bike and train often. 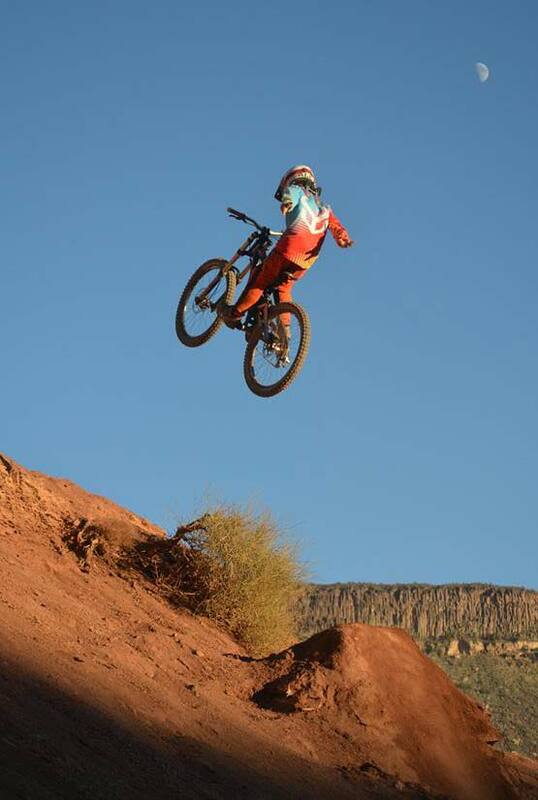 Alex Mallen steps up near Virgin, Utah. Photo by Liz Mallen. Utah has been home to the Red Bull Rampage freeride event since its inception. Here is Dillon Flinders getting sky-high at the original venue. Photo by Tyson Henrie. 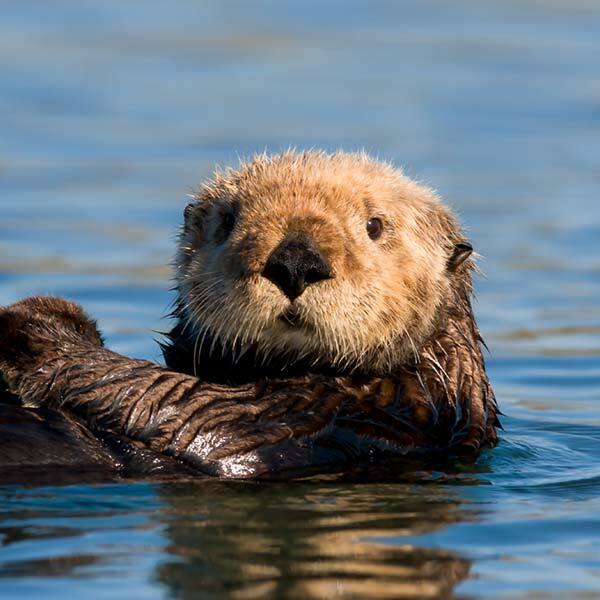 You can read coach Henrie’s blog article about his team’s adventures at the 2018 Sea Otter Classic here. 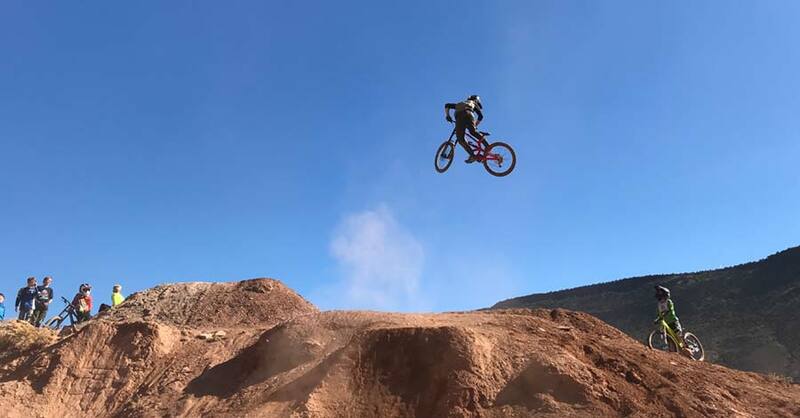 All the riders who traveled from Utah and raced earned valuable experience at one of the country’s largest mountain biking events. One of the most important parts of coaching the Outlaw Bike Team’s competition level is the teamwork that develops between the kids. “A lot of them will work really hard to help out their teammates and bring them along. It’s been really cool to see. They have upped their game because they love the sport so much and they enjoy being a part of it. But they’ve also learned that they can do what they previously didn’t think they could do,” said Tyson. Many of the parents of Outlaw Bike Team’s riders are very involved in the sport. Some of them are experienced mountain bikers themselves. “The parents are a huge part of the team. Biking is a great opportunity for the parents to be involved. A lot of times the dads ride with us. Unless I ask them not to! They are extremely supportive. For something like this, with how young the kids are, it’s almost mandatory that they are around or close by. Just in case something happens – you know, if the bike breaks, the kid gets hurt, or something happens – the parents are there to support that,” stated the coach. Let’s be realistic – these kids are fast. The best and safest way to “keep up” is to follow them through their social media accounts. 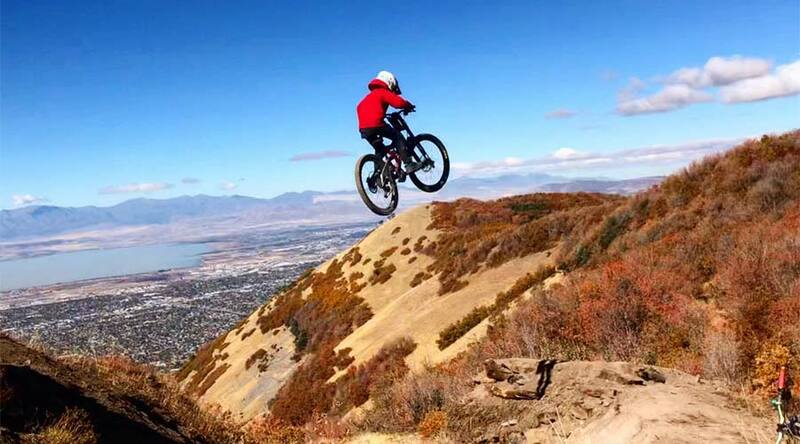 Matt Gallard irons out something sketchy in the Provo foothills. Photo by Tyson Henrie. In the immediate future, all three of Outlaw Bike Team’s levels will be competing in the sport. There are some big plans in place for the Competition team. “We’re hoping to get Dillon [Flinders] to World Junior Champs. Some kids are going to the Pro GRTs and we’re going to Whistler For 3 weeks. Lots of good plans. That’s our ultimate goal – to provide whatever level of coaching and riding is needed for kids in Utah. If they want to go to the World Cup, then hopefully we can provide that base for them to get there,” said Tyson.